Book a stay near the river to enjoy this North Carolina military town. It’s time for a trip to Jacksonville. Which one? Jacksonville, NC, of course. This lovely seaside retreat has a fun downtown, great restaurants, riverside views, and Southern charm to spare. 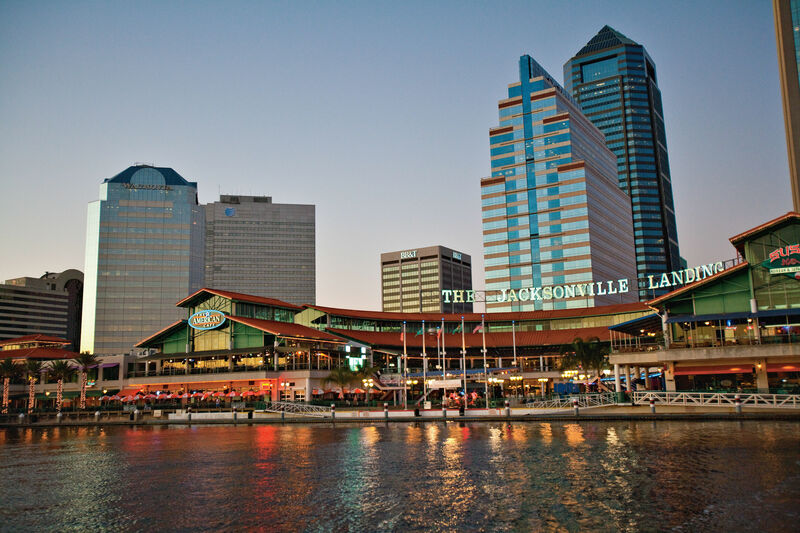 Jacksonville is located in eastern North Carolina on the banks of the New River, just a stone’s throw from the Atlantic Ocean. It’s known for Camp Lejeune, the U.S Marine Corps base and training facility located there. Jacksonville is an ideal location for a vacation thanks to the nearness of the coast (with ocean breezes aplenty), and because it’s situated near the picturesque Croatan National Forest. Plan a weekend getaway to Jacksonville, and you’re guaranteed a refreshing coastal escape. Book a stay riverside (for beautiful views) or near downtown (for delicious eats). Be sure to check the town website for all the info you need to plan your visit, and don’t forget to take your crew to Wilson Bay and Wilson Bay Park for great views of the New River’s sapphire waters—and plenty of room to roam. The Atlantic beaches are just a quick drive away; North Topsail Beach, for example, is a 25-minute drive south. Meander the lighted boardwalk and pier of New River Waterfront Park to take in the sights and sounds of the river. Pack a lunch and settle in at the park’s picnic tables to watch the boats drift by. Bring your own or rent some kayaks to explore Hammocks Beach State Park and the surrounding paddling trails. Paddle out to Bear Island, an undeveloped barrier island with a big, serene beach. Nearby Topsail Island has gorgeous barrier beaches perfect for taking in a sunset or sunrise. It’s a sea turtle sanctuary, and—legend has it—the pirate Blackbeard hid his treasure on Topsail! A 45 minute drive southeast of Jacksonville takes you to Emerald Isle, a coastal escape where you can dip your toes in the water or go all in with paddling tours, boat rentals, and fishing charters. Onslow Beach at Camp Lejune is located between the Intracoastal Waterway and the Atlantic Ocean. 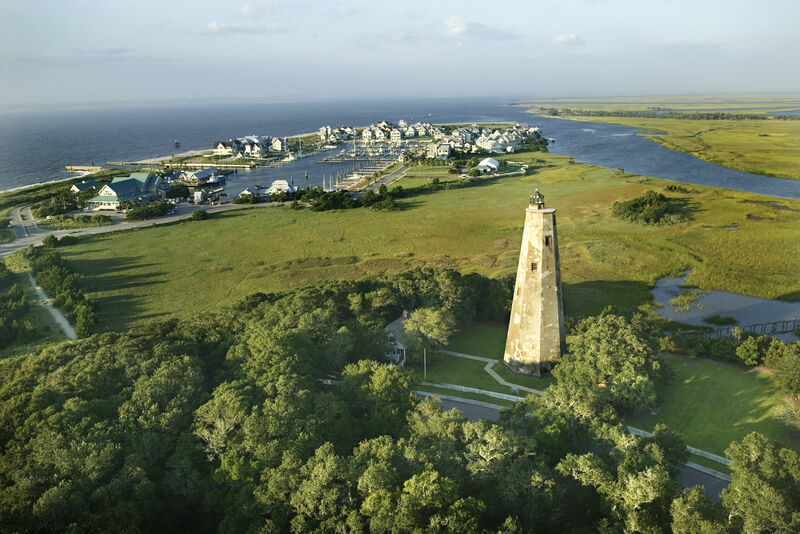 According to the website, “Onslow Beach is open to all authorized DoD ID card holders with proper base access.” Check the FAQs section of the website for reservation details and guidelines, as well as notifications of when the area will be closed to visitors. Bring your paddleboards, kayaks, and sunscreen to enjoy the surf and sand at the town of Wrightsville Beach, an oceanside spot with clear waters and family activities galore. While in Jacksonville, go on a boat tour with Bayonet Enterprises Cruises, explore the Lynwood Park Zoo, or pay your respects at the beautiful Lejeune Memorial Gardens and the Veterans Memorials located in the gardens. While in Jacksonville, eat as the locals do, and stop by Mission BBQ (for brisket, pulled pork, and A+ sides), Mi Cabana Mexican Restaurant (for tacos, fajitas, and the rest of the classics), The Impeccable Plate (for healthy, super-fresh options), Carolina Ale House (for pub eats plus a pint), Pho Le (for best-kept-secret noodle bowls and rice plates), Forkful (for salads, wraps, and rice bowls), Abruzzo’s Pizza (for hand-tossed specialty pizzas, calzones, and stromboli), and Liliana’s Colombian Restaurant & Bakery (for breakfast, lunch, and dinner—and delicious goods from the bakery). Don’t forget a stop at our favorite Jacksonville-area diner, known to all as Jeff’s Burgers, Dogs, and Shakes, for an unassuming but oh-so delicious lunch. You'll also want to settle in for a beachside meal of fantastically fresh seafood at the Osprey Grill. To quench your thirst, stop into The Milk Road for morning coffee and then check out either Brewed Downtown or Muddy’s Coffee House for a fresh brew alongside a soup-salad-sandwich lunch menu. Check into a comfortable Jacksonville hotel to ensure you’re near the sun and the sand. You’ll have free WIFI and an outdoor pool at the TownePlace Suites by Marriott. Find all the basics plus a free buffet breakfast every morning at the Holiday Inn Express in Jacksonville. A continental breakfast, pool, and bar/lounge await guests at Jacksonville’s Fairfield Inn & Suites. Browse these lovely Jacksonville-area vacation rentals so that you and your family have all of the comforts of a true home away from home. Book using a site such as VRBO for a quality stay. Book a lovely 2-bedroom cottage in downtown Jacksonville near Riverwalk Park for convenient access to the New River and to be within easy walking distance of great restaurants. This 6-bedroom, 3+-bath waterfront home—and its private pool—are situated on the New River near downtown Jacksonville. This 2-bedroom townhouse overlooks Wilson Bay and has easy access to the area’s parks, military bases, restaurants, and shops. Pack your bags, load up the car, and drive your family to Jacksonville, North Carolina, for a coastal escape—and a vacation you’ll never forget.